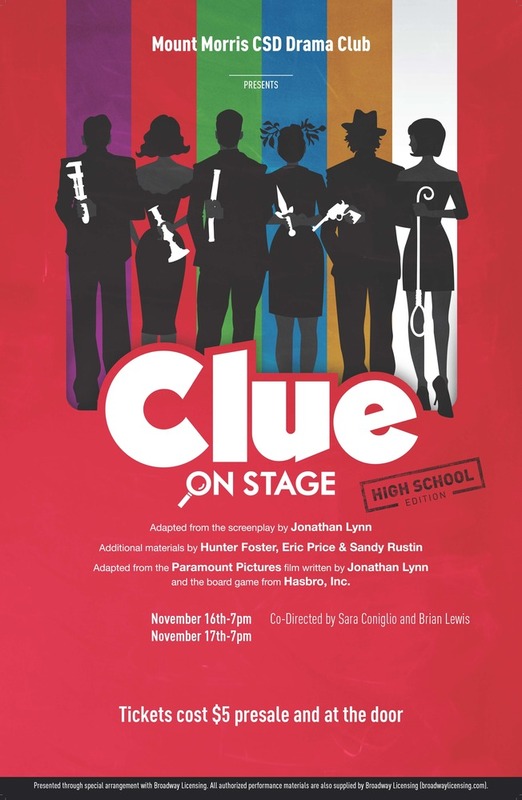 The Mount Morris Drama Club is proud to present the mystery/comedy Clue: On Stage on November 16th and 17th, 2018 at 7 pm. Tickets are only $5.00 at the door. Refreshments are available for a small fee. Based on the cult classic film and the popular board game, Clue is a madcap comedy that will keep you guessing until the final twist. It's a dark and stormy night, and you've been invited to a very unusual dinner party. Each of the guests has an alias, the butler offers a variety of weapons, and the host is, well . . . dead. So whodunnit? Join the iconic oddballs known as Scarlet, Plum, White, Green, Peacock, and Mustard as they race to find the murderer in Boddy Manor before the body count stacks up!